There are not many things that I buy frozen – peas, broad (fava) beans, soybeans and berries being the exception. Unless you have them growing in your garden, frozen peas and those two beans don’t come much fresher than this as they are often frozen a couple of hours after being picked. I find it very therapeutic to pod the beans, and the reward you get when you eat something like this makes it worth the while. I do personally prefer to use sourdough bread but in Britain this is not something that you find easily. Most bread that you find on supermarket shelves is mass produced and contains improvers, enzymes, stabilisers, emulsifiers and preservatives to make the bread stay soft and without deterioration for up to a week, which is completely unnatural. Oh dear, once I get started on bread it’s hard to stop me as this is something I am very passionate about. If you refrain from eating bread because you think you have wheat intolerance, try eating sourdough bread - or other properly made bread with very little yeast and none of the above mentioned horrors. You might be pleasantly surprised to find you can eat this without a problem. 1. Cook the beans in a pan of simmering water for 2-3 minutes. Drain and then cool the beans under cold running water to stop them from cooking any further. Once cool, peel off the skin of each bean (the skin slips off easily when you pinch the ends). 2. Crush the broad beans lightly with a potato masher or fork. 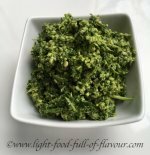 Bash the parsley and basil in a pestle and mortar and add to the broad beans together with the olive oil, lemon juice and parmesan cheese and season with salt and pepper. 3. Poach the eggs in a shallow pan of barely simmering water for 2-3 minutes. 4. Meanwhile, toast the bread. 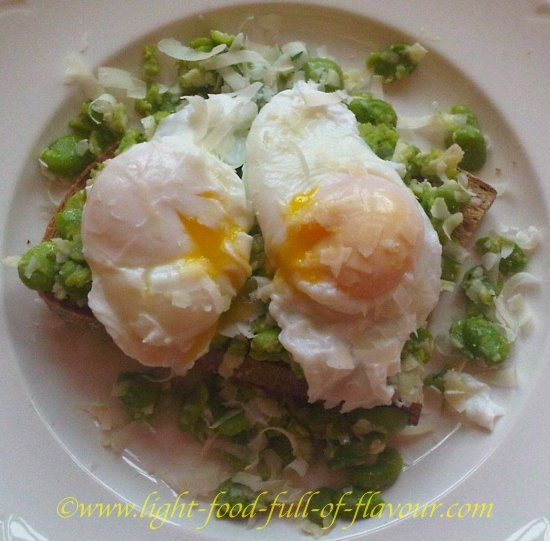 Divide the broad bean mix over the top of the bread and put 1 or 2 poached eggs on top of this. Scatter over some more grated parmesan cheese.